Originally published under the title "Assad Is Bad News." Misguided voices in Israel and elsewhere argue that a strong Syrian president with firm control over the state is a vital interest for Israel. This amazing conclusion was drawn from the long quiet period along the Golan Heights border during the strong dictatorship of the Assad family. The notion that it is preferable to have strong enemies is strange. Common sense tells us that weak enemies are preferable because they can do less damage. Violent conflict is about exacting pain from the other side. States are more dangerous than militias and terrorist groups. A weak Syria can cause less pain than a strong Syria. A Syria embroiled in civil war has much less energy and means to hurt Israel than a strong Syria. A dysfunctional Syrian state torn by civil war is not a result of Israeli machinations, but a positive strategic development from an Israeli point of view. What is left of the Syrian army is busy protecting the regime and trying to expand the territory it holds. It is not capable of challenging the IDF in a conventional war, and it will take years for it to build a serious military machine. A Syria embroiled in civil war has much less capacity to hurt Israel than a strong Syria. Nor is the Syria of today able to wage an effective diplomatic and/or military campaign aimed at the return of the Golan, which constitutes a defensible border for Israel in the north. Above all, the survival of the Assad regime is a victory for Iran – the main source of trouble in the Middle East and Israel's archenemy. A restored Syrian state, under Assad, will secure for Iran the Shiite corridor to the Mediterranean. It's not clear that even the Russians, who support Assad, have this goal in mind. An Iranian presence along Israel's northern border is more threatening than warring Sunni militias. 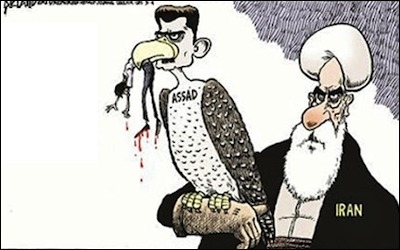 The survival of the Assad regime is a victory for Iran – the main source of trouble in the Middle East. It is also argued that a strong regime, such as Assad's before the outbreak of the civil war, is more easily deterred by Israel than would be the nonstate organizations that might replace Assad. Deterring nonstate organizations is certainly tricky, but the Syrian case study refutes this claim. Limiting the analysis of the Israel-Syria relationship to the post-1974 period and to the Golan arena is methodologically faulty. Assad the father, a strong dictator, attacked Israel in 1973 and sent his air force to challenge Israel's in 1982. He did indeed keep the border on the Golan Heights with Israel quiet after 1974, but supported Palestinian and Lebanese militias to bleed Israel from southern Lebanon. When his son lost much of his control over the Golan Heights to opposition militias during the civil war, Israel did not detect any significant rise in hostile violent activities across the border. Similarly, Hezbollah in Lebanon seems to have been deterred, particularly after the 2006 war. The lack of variation in violent activities seems to suggest that the strength of the regime in Damascus has little effect on the situation along the border. It isn't clear that policies pursued in the 1974-2011 period will continue if Assad regains his country. Israel's military superiority was obviously the main factor in assuring quiet along the border with Syria. Moreover, it is not clear that policies pursued in the 1974-2011 period will continue if Assad regains his country. Extrapolations about the future are very problematic, particularly in the Middle East. So far, Israel's deterrence, admittedly a somewhat blurry concept, has worked on the Golan Heights. It has required, as expected, the occasional use of force. The attempts by Hezbollah and Iran to establish an operational base on the Syrian side of the Golan Heights were nipped in the bud by force. This shows that even in the case of partial Syrian control, Israel can achieve quiet. Yet Israel continues to fear that in the case of a full return of the Syrian side of the Golan to Assad, Iran will have chance to establish a foothold there. 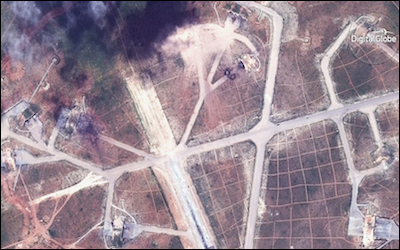 The U.S. launched cruise missile strikes on Shayrat air base in Syria on April 6 in response to the Assad regime's use of chemical weapons. The Syrian crisis also has international ramifications that Israel cannot ignore. The Russians have actively supported the Assad regime, while the Obama administration refrained from interfering. The new American president, Donald Trump, used force to punish the Syrian use of chemical weapons. It also intervened militarily when Assad's forces got close to American proxies in east Syria. In the absence of an American-Russian understanding, Assad is clearly on the list of the bad guys in Washington. Israel can ill afford to come out against Trump's preference. If Assad wins the civil war and establishes a stable regime, we have no reason to expect good intentions toward Israel. His penchant for anti-Israel rhetoric is well known, and a rebuilt Syrian education system will continue to propagate hatred for the Jewish state. The alliance with the Islamic regime in Tehran (in place since 1979) buttresses the anti-Israeli orientation that may under certain circumstances turn into active measures. Syria has developed a domestic capability to produce chemical weapons, and Assad has shown he has no moral qualms about using such weapons against his opponents. Noteworthy, Assad junior, entertained nuclear ambitions that received Iranian and North Korean support. Israel is a spectator with little leverage over domestic dynamics in Syria. We may wish for a strong and stable regime in Syria only if it is no longer an enemy and is ready to make peace with Israel. So far there is no indication that the Assad regime is interested in such a drastic change of policy. However, some elements in the opposition voice different views concerning Israel. This does not warrant a change in Israel's policy of non-intervention. It is worth remembering that Israel is a small country with very limited capacity to influence political developments beyond its borders. Israel did not weaken the Assad regime and cannot uproot the opposition to it. It is a spectator with little leverage over domestic dynamics in Syria. Finally, expressing support for the genocidal Assad regime is morally reprehensible. It is true that in the real world, democracies cooperate with dictatorships. But the Assad regime is not a regular dictatorship. It is responsible for hundreds of thousands of casualties, for using chemical weapons, for ethnic cleansing, for massive destruction, and for millions of refugees. The Jewish State should not advocate the survival of such a terribly ruthless regime. In the case of Syria, strategic requirements are complemented by moral imperatives. Efraim Inbar, professor emeritus of political studies at Bar-Ilan University and founding director of the Begin-Sadat Center for Strategic Studies (1991-2016), is a Shillman-Ginsburg fellow at the Middle East Forum.